The FTSE 100 has had another good year so far, up more than 15% including dividends. From the lows of March 2009 its total returns have been more than 100% and some investors have started to get nervous. 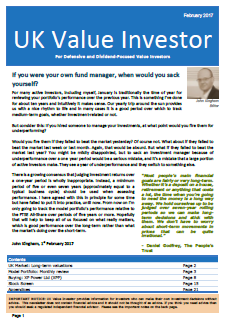 The “wall of worry” is as good a description as any; the higher the market goes, the more investors worry; but are they right to worry? Here we can see that over the past 30 years the FTSE 100 can be split into two halves – The happy days of the 80s and 90s where the market went up with very little volatility (except the market crash in 1987), and the much less happy, sideways bouncing years that we’ve had since 1999/2000. From this chart it seems that there is an invisible barrier at 7,000. Perhaps this is some natural limit that the stock market simply cannot pass? I don’t think so. The problem with looking at the market in this way is that all we can see is the price. It’s like me asking you if you want to buy a car for £10,000, but not telling you what car you’d be buying. If it’s a brand new Rolls Royce Phantom then you’re getting a good deal, but if it’s a 1988 Ford Sierra then perhaps the deal is not so good. We need to see some information about what exactly we’re buying when we buy the FTSE 100. Of course what we’re buying is a group of 100 companies, but we don’t even particularly want the companies, what we want is a piece of their profits and their dividends. Along with the price of the FTSE 100 (its index level) we also need to look at its earnings, and specifically its smoothed earnings. Smoothed earnings remove most of the effects of the business cycle, whose short-term ups and downs just confuse matters. These smoothed earnings are most commonly measured using CAPE (Cyclically Adjusted PE), which is the ratio of the price to the average inflation adjusted earnings of the past decade. The chart below overlays the price of the FTSE 100 with a range of CAPE values so that we can see where the market is, in terms of how expensive or cheap it is, relative to the kind of CAPE values it has had in the past. During the past 25 years the market’s valuation has swung from more than 30 times its cyclically adjusted earnings at the peak of the dot-com bubble in 1999, down to less than 12 times its cyclically adjusted earnings in the lows of 2009. Today the FTSE 100’s price is close to where it was in the dot-com bubble. However, since then the cyclically adjusted earnings of the FTSE 100 companies has increased smoothly over time, and that’s what we should expect it to do because of inflation and long-term economic growth. And, as the cyclically adjusted earnings grow, so to do the valuation bands. So even though we are close to an all-time record price, we are not even close to record valuations because the value of the index (as measured by its earnings) has gone up considerably. 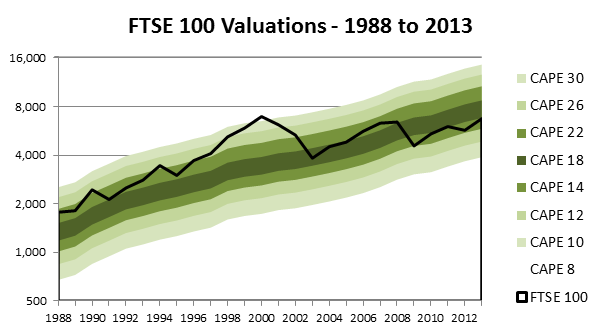 Because of the growth of earnings over the years the FTSE 100 now has a CAPE of around 14, which is at the lower edge of the central band of CAPE values which runs from 14 to 18, and which I call the “normal” valuation band. So what does this all mean? 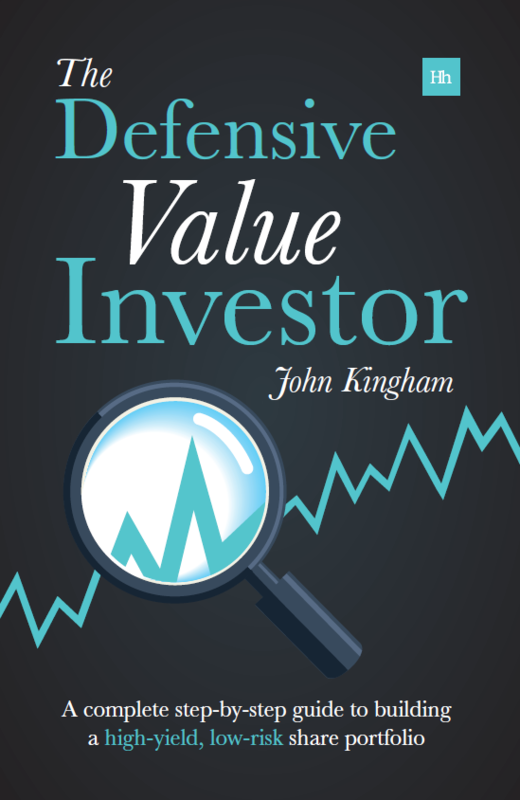 It means that even though the FTSE 100 is close to its all-time highs, it is still relatively cheap compared to the valuation multiple that investors have been willing to pay in the past. It means that even if we break through the 7,000 barrier it still won’t be expensive. In fact, the FTSE 100 would need to be almost 9,000 before I would even begin to call it expensive. Of course the market could still fall (and probably will), but at these relatively low valuations, for long-term investors, I think that would be an opportunity and not a risk. I tend to agree, but we need to keep in mind that the peaks of 2000 and 2007 were irrational and we can’t expect irrationality to break out all the time. I think I’ll be starting to worry around the 7500 mark. Hi SG, I think 2000 was irrational but 2007 wasn’t all that bad. CAPE was still under 20 and was similar to the levels seen throughout most of the 80s and early 90s. From a technical point of view (i.e. chart gazing) 7,000 will be a huge barrier I expect. But once we’re through that, and if we can build reasonable support at that level, we could easily blast on up to 8,000 in 2014. Of course such comments should be seen in within the context of the big picture, which is that multi-decade results are what matters, not whether or not we hit 7,000 or 8,000 in a year or two. Hi Monevator, if you’re talking about the full 30 year period then I think you mean 1,000% total return, not 100? That’s about right. An 8% annualised return over 30 years is just over 1,000% and 8% is about the long-run average. And you’re right that dividends are (very) important but they’re irrelevant for CAPE valuation purposes which is why I didn’t mention them. What scared me about the 2008-2009 falls was how broad it was. Financial recessions are thought to be the worst , longer and deeper. It seemed to me that something like the falls of the early to mid 70s would be more appropriate. Is there any data of this type for that early period ? You can see how bit the falls were and what the CAPE values were at the time. The real problem is that the range of possible valuations is quite large (increases by a factor of about 4, from CAPE of 8 to about 32, very approximately). So we could have the FTSE 100 at 4,000 in a few years or more than 12,000! Either seems unlikely and probably is, but they’re also within the bounds of reasonable possibility. Many thanks John , history has its value. Indeed I feel that the ‘error bars’ in this sort of estimation are often large and unpredictable. It seems to me that so much rests on market sentiment which is a fickle quantity to measure. Outside of the obviously high and obviously low it can go either way. Personally I think that looking at how much time the market spent at 4000 in 2003 in relation to 2009 gives us an inkling of its preference. Your questions are hard for me to answer. I am optimist about the stock markets, but I don’t know if FTSE 100 will be above 7,000 or 8,000 next year, I don’t have a clue. It looks to me that we managed to put our stocks market on steroids (QE) and withdrawal symptoms are high when we speak about reducing the active substance named QE. Multipliers have increased in the last 12 months and earnings have also increased. Will these going to increase in the future? I am not sure but I am optimistic. It looks there is some activity in the property market, a bit more lending is going on, but I don’t think we will do a repeat of 2003-2008. I would not like to see the residential property going up and crashing once again and I would prefer to see more capital expenditure, as some companies have lots of cash now on their balance sheets. I don’t look in the rear mirror, so for me what happened in 1970, 80 or so have little relevance. I expect higher volatility in the year to come due to investors trying to understand what’s going to happen with QE and contradictory information about the future world economic growth. This is what I name false starts. Wouldn’t it be better to use a PEG10, since the long term growth rate of earnings might change over time? I was reading that the CAPE for the US market as judged by the S&P 500 is about 50% above its long term average. So does that imply all things being equal the UK is a better place to invest now? Hi Andrew, I would say possibly, but it depends on what the correlation between past growth and future growth is. The assumption is twofold I think. One is that growth of cyclically adjusted earnings is pretty stable, which it is, so past earnings growth rates tend to look quite like future growth rates, so there’s no great advantage to adding them into the mix. Second is that CAPE is significantly better than PE, but it’s still a very noisy measure, i.e. you can’t say CAPE of 20 (or whatever it is in the US) is high, therefore returns in the next year (or five) will be low. You just can’t make very definite statements about it, so additional fine details like growth rates will just get lost in the noise. I would say that all else being equal the UK is better than the US at the moment, but that may not be obvious until we look back a decade from now (or even two). And over that timescale other factors beyond CAPE may have more influence. It looks at using CAPE across multiple country indices. It’s an idea that I wanted to play with about 10 years ago but I’ve never had the data, and amazingly I’ve never seen anybody build an ETF based on it either. It seems like a no-brainer global equities strategy that should outperform both absolutely and on risk adjusted terms. Basically you tilt an equally weighted mix of country indices towards those with lower CAPE values.